How can social media improve AF patient and provider interaction? It was an honor to speak at the seventh annual Western AF symposium this past weekend in Park City Utah. Once in the shadow of the Boston AF symposium, Dr. Nassir Marrouche (@nmarrouche) and his colleagues at the University of Utah have elevated Western AF to elite status. It’s a special meeting because it brings the world’s leading experts in atrial fibrillation to a cozy and welcoming place. The “vibe” if you will is informal and warm–serious, yes, but conducive to interaction. Perfect, if you ask me. 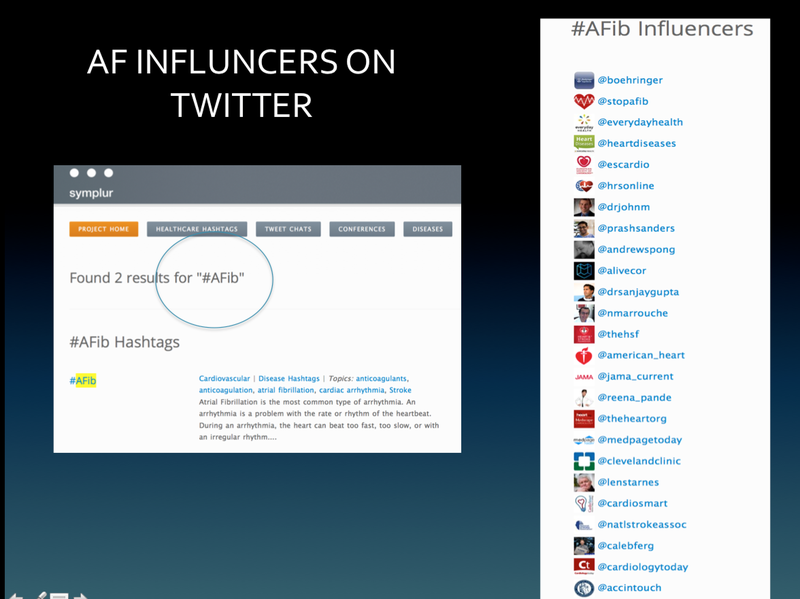 My task was to explain (in 20 minutes) how social media could improve the care of patients with atrial fibrillation. It was a striking contrast; giving a presentation on social media amongst such ‘hard” science felt as if I was responsible for the mandatory humanities course for science and engineering students. The irony, now, of course, is that I feel medical education is deficient in such topics. You know, those that help a doctor understand the person, not just his or her disease. Hi. My name is John Mandrola. I practice clinical electrophysiology at a 500-bed community hospital in Louisville KY. 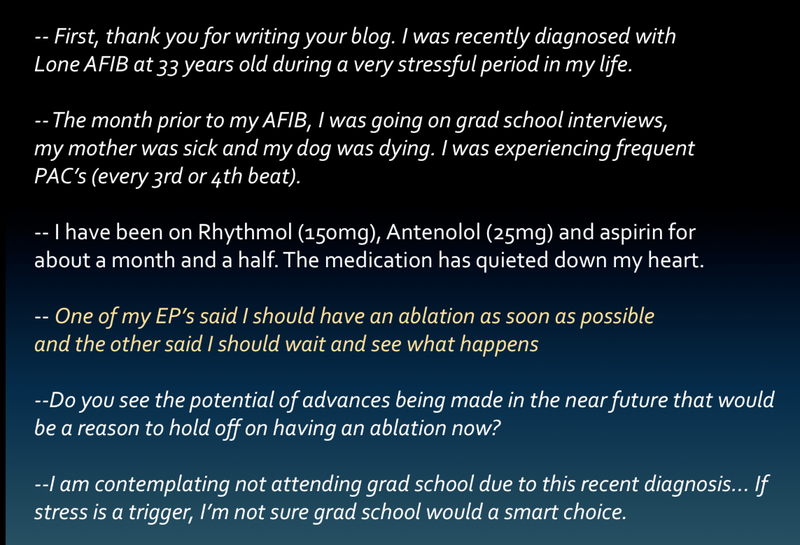 Though I still implant devices, the great majority of my practice involves ablation – and the great majority of that is for AF. I trained at IU in the 1990s. I learned to ablate AF with my colleague Dr. David Mann. We did our first AF ablation in 2004. Six years later, in 2010, I had the immense fortune of spending a week in Hamburg Germany. 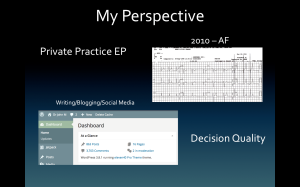 Needless to say, my approach to ablating AF was greatly influenced by the school of Feifan Ouyang, Eric Wissner and Alex Furnkranz. And now… since I don’t have a rotor-finding device, I am resigned to isolating PVs as durably as possible. Another influence for me occurred In 2010. On a hot summer bike ride, my heart rate monitor started producing quirky data. About that same time, power left my legs, I gasped for air, sweated profusely and felt faint. 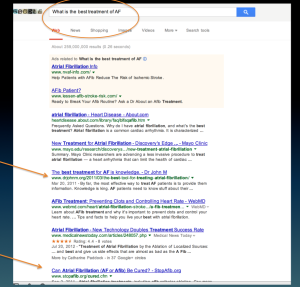 When I got home –hours later– it was clear that an AF doctor was in AF. 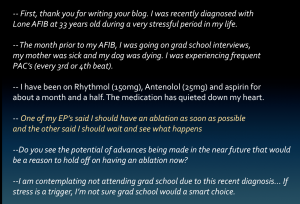 This year-long experience with AF taught me a lot – not the least of which was that it is one thing to prescribe a therapy such as Flecainide – it is yet another to swallow that white pill yourself. Thirdly, I race bikes. I am on a sponsored masters bike team. Each member is assigned a task to help the team. Mine was writing race reports. This task led me to learn more about the craft of arranging words. One lesson I learned quickly was that it is best to write about that which you care about most. 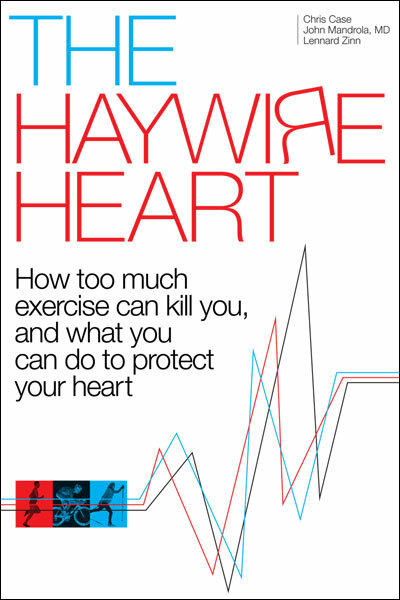 For me, this is health, medicine, electrophysiology and AF in particular. 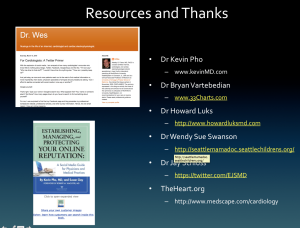 And this too was fortuitous: a lot of endurance athletes get AF and they go online for information. 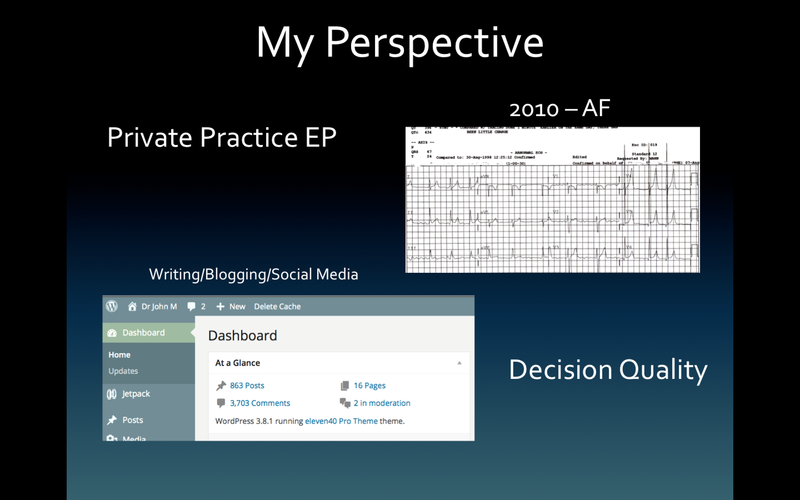 My writing about medicine along with my view of patient care from the front lines of healthcare led to my current interest in decision quality – which I hope to convince you is something that can be enhanced by social media. 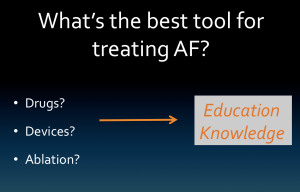 1 ) AF is a growing and major health problem – and It afflicts a diverse patient population 2) Though things continue to improve, we offer imperfect treatments. 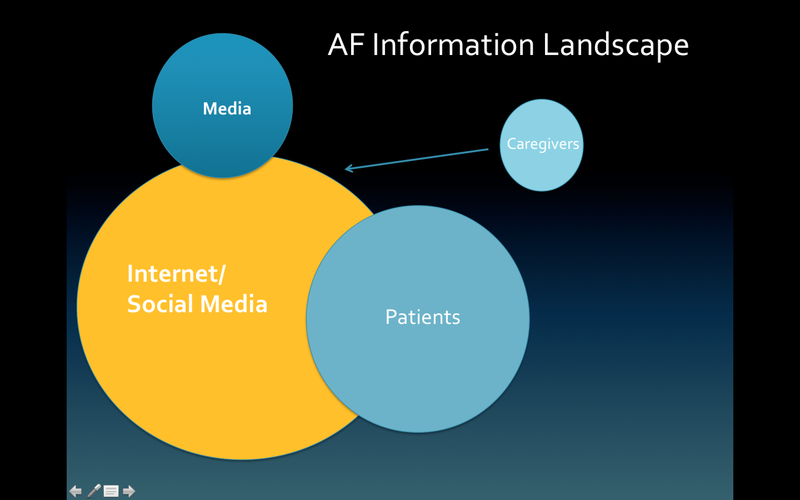 3) Nearly all approaches to patients with AF are preference–sensitive. No patient really “needs” to have an ablation or take an anticoagulant 4.) 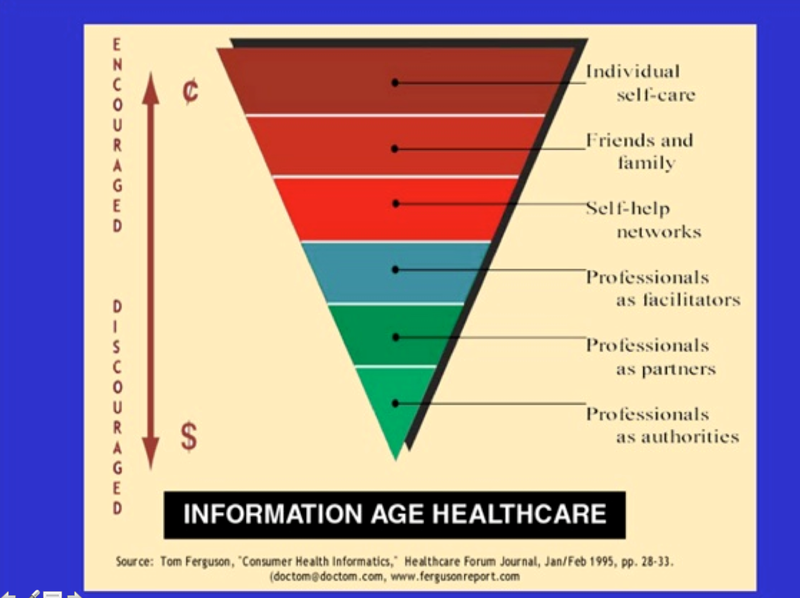 Information and effective communication in the doctor-patient relationship is everything. 5.) The Internet is a major source of information. 6.) Social media is changing the landscape of how humans connect and gather information. I use whiteboards in the exam room. I usually start and finish with this image. On the one hand is the disease AF. Yet on the other is our therapies–some of which are no small thing. The caregiver’s oath calls us to do no harm. 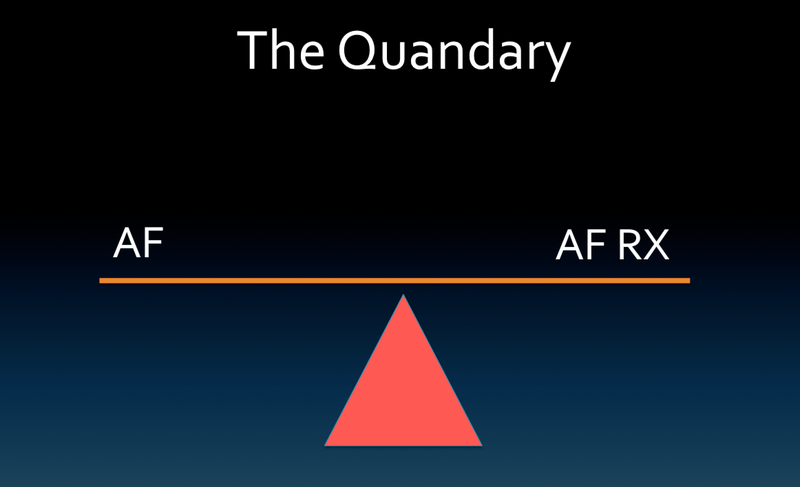 Treating AF is precarious that way. 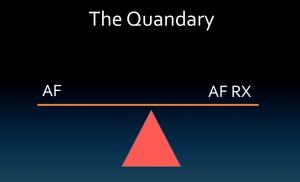 A quandary … >> a state of uncertainty over what to do in a difficult situation… <<< Word precision wise – that’s about perfect for AF decisions. My iPhone camera log has many such examples. Yours probably does too. I don’t mean to pick on propafenone. 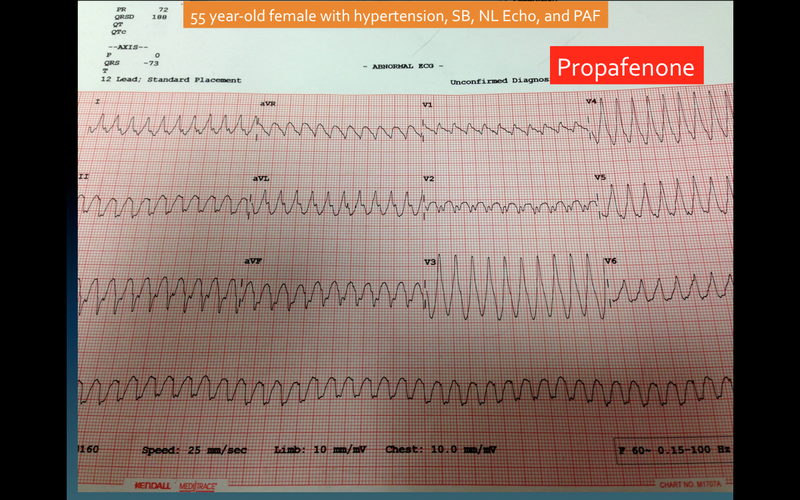 The list of images of complications from treating AF is a long one. 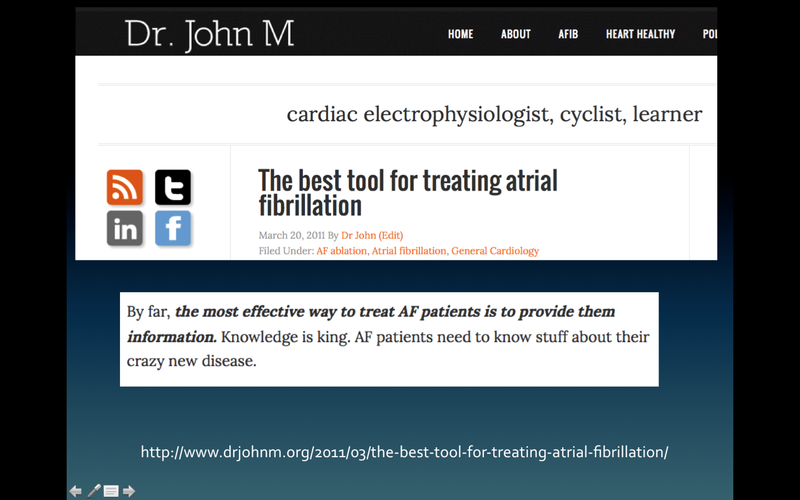 Slide 8: The best tool for treating AF: I’ve said this before. 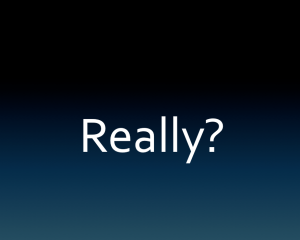 Slide 9: This image points the audience to the power of social media. 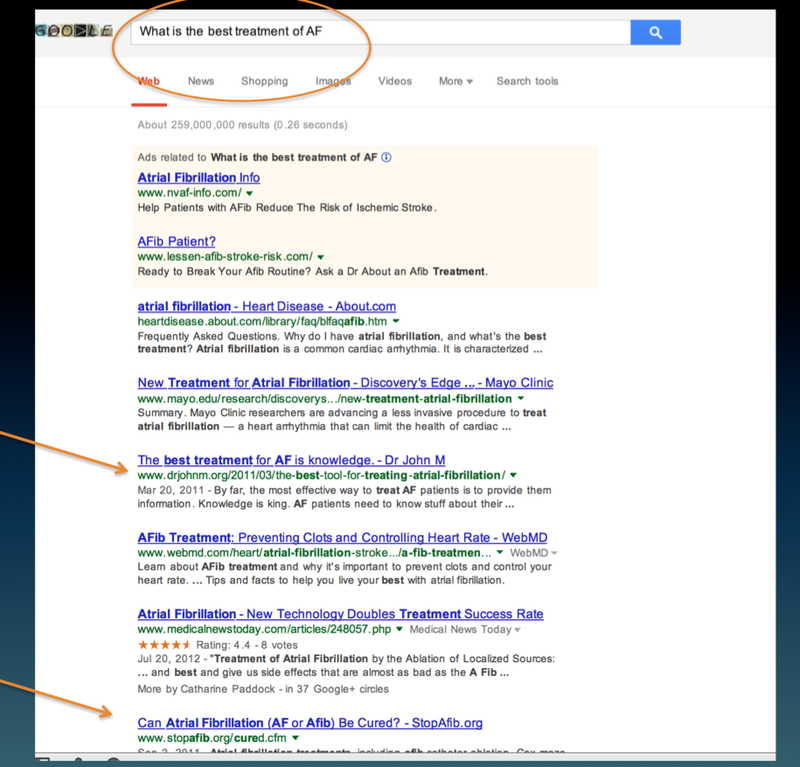 Here you can see that if you type “What is the best treatment of AF?” into Google, my 2011 post appears on the first page. A blogger writing about AF gets on the first page of a Google search? The stopAF website, a patient-advocacy site, is also on the first page. 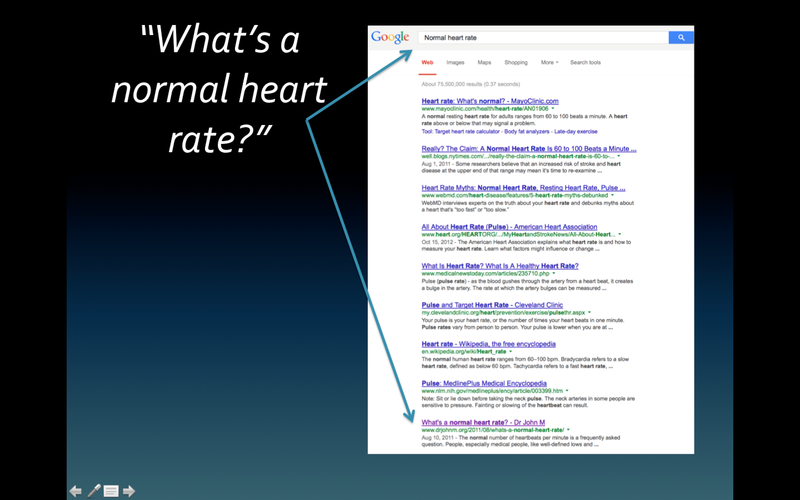 I do no special search engine optimization. Just a blog on a free blogging platform. 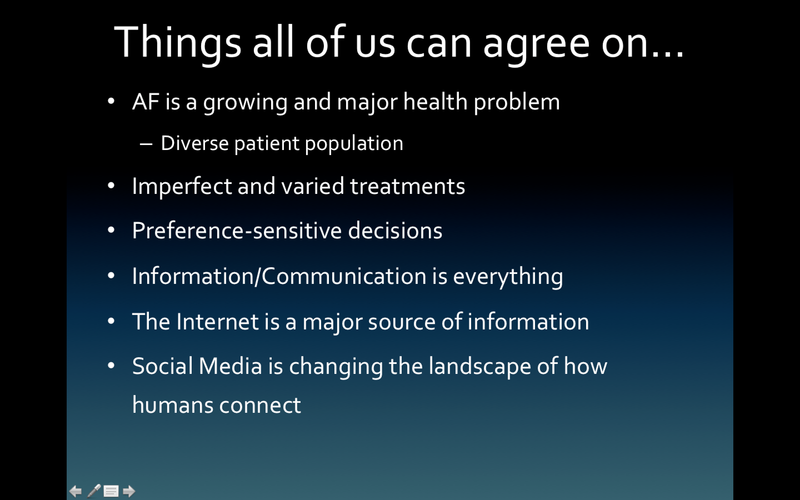 Slide 12: Makes the transition to the power of the Internet. This year marks the 25th anniversary of the Internet. Also noteworthy: this same survey found that more Americans would give up TV before Internet access. 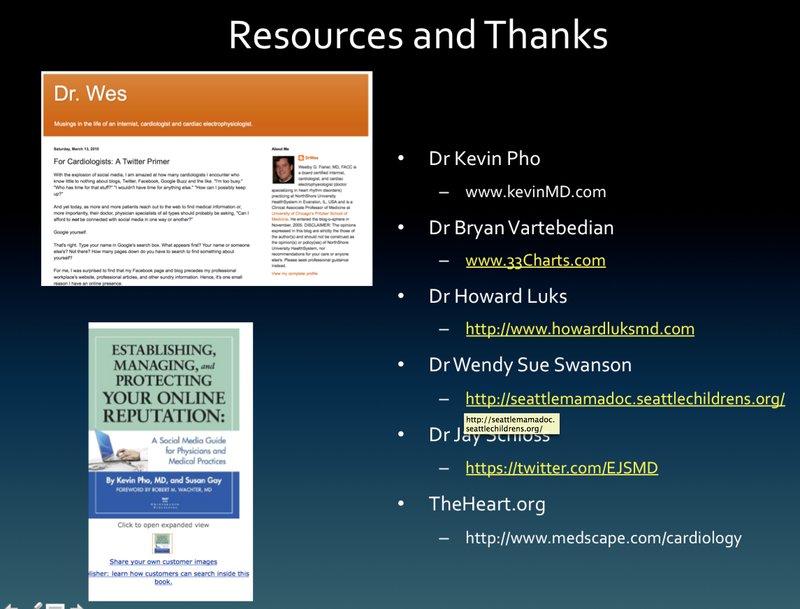 Slides 17, 18 and 19 provided statistics on Facebook, Twitter and YouTube. 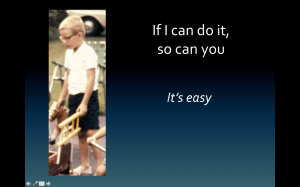 For brevity sake, I attach just the YouTube slide. Everyone knows the stats on FB and Twitter. As you can see, I am not much of a video guy. 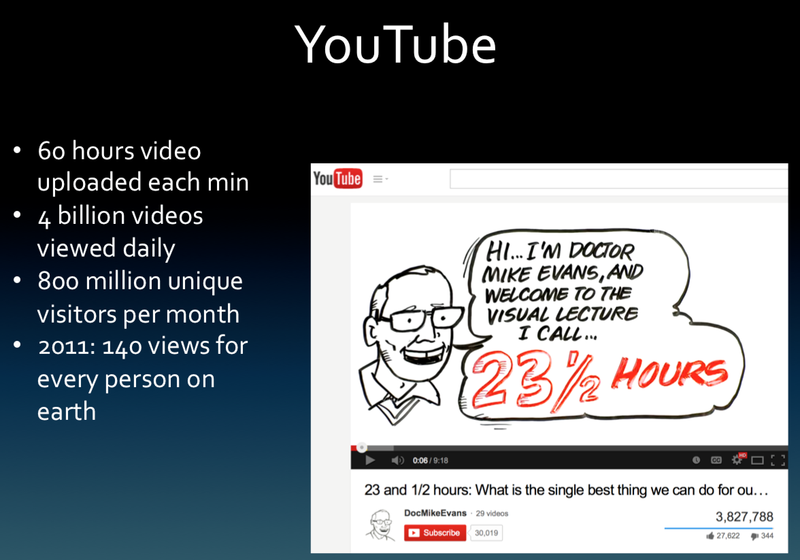 But you may be…YouTube also boasts staggering numbers. 1) 60 hours of video uploaded every minute 2), Four billion videos viewed daily 3) 800 million unique visitors each month 4) In 2011, there were 140 views for every person on Earth. I use this screenshot of Dr Mike Evans. 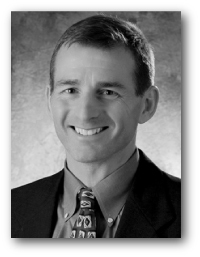 He is an academic primary care doctor in Canada. His research interest is using video as a classroom. This 9-minute video discussing the evidence base for exercise as a therapy has more than 3 million views. It’s that good. I repeat: minutes – not hours. 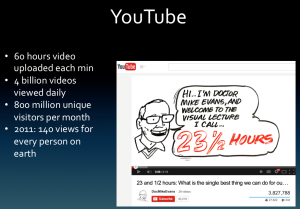 For the record – It takes mere minutes to upload a video. I use YouTube to post videos on my blog. Symplur is a high-end web development company that specializes in healthcare social media. 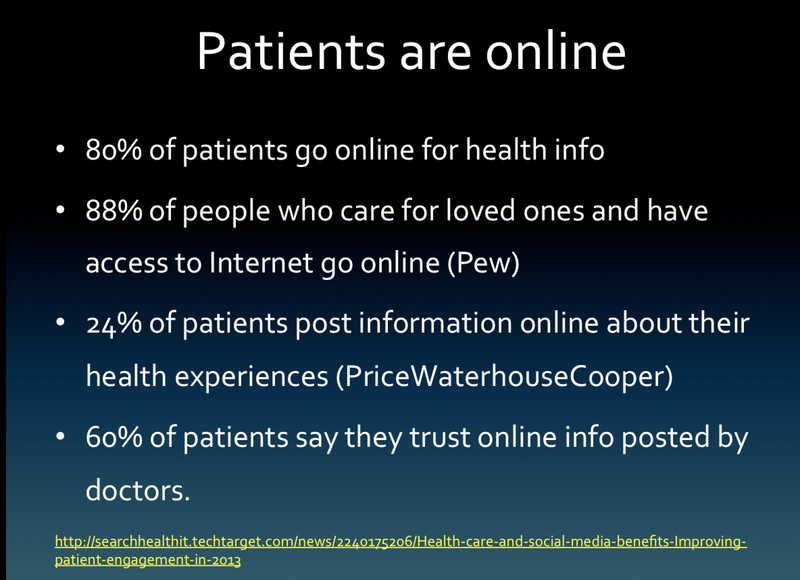 Lately it has focused on analysis of what’s being said about healthcare online and by whom. 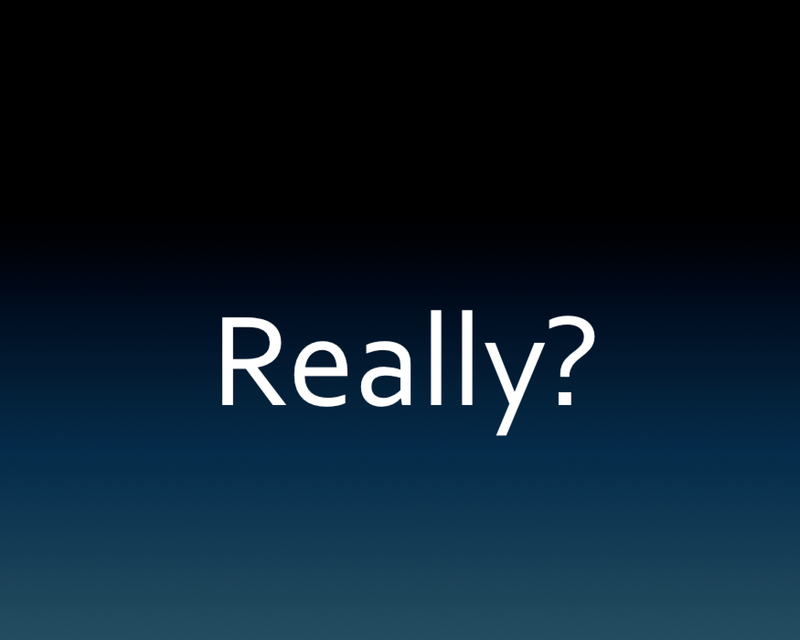 A common way for people to associate online is with a hashtag. It may be for a disease, or a meeting or an entire field of study. The hashtag for AF is #afib. #WesternAF is the hastag of this meting. My point here is that there are not many influencers. And that a neurosurgeon and TV personality ranks higher than many in this room is telling. Also note who is on top of the list–Industry. Think what you will of that. 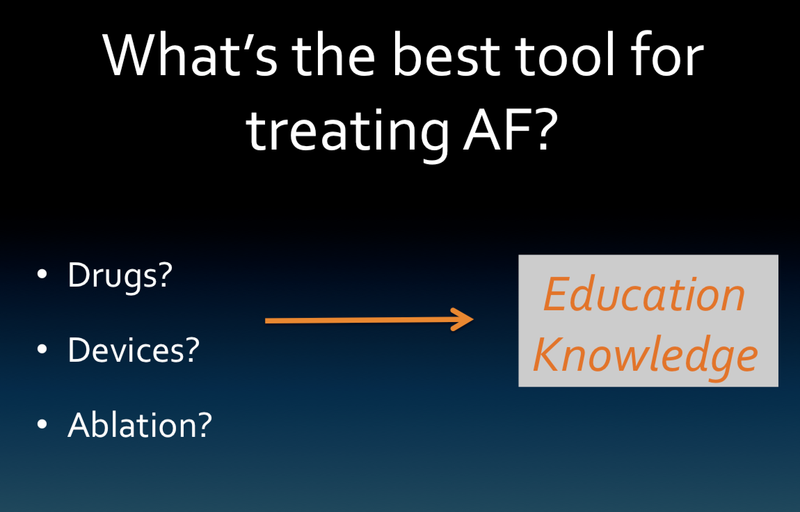 Successful AF treatment is a team sport. AF patients can’t be passive. They have to be learners. Think about warfarin – you can’t just take warfarin…. Same with the NOAC drugs. 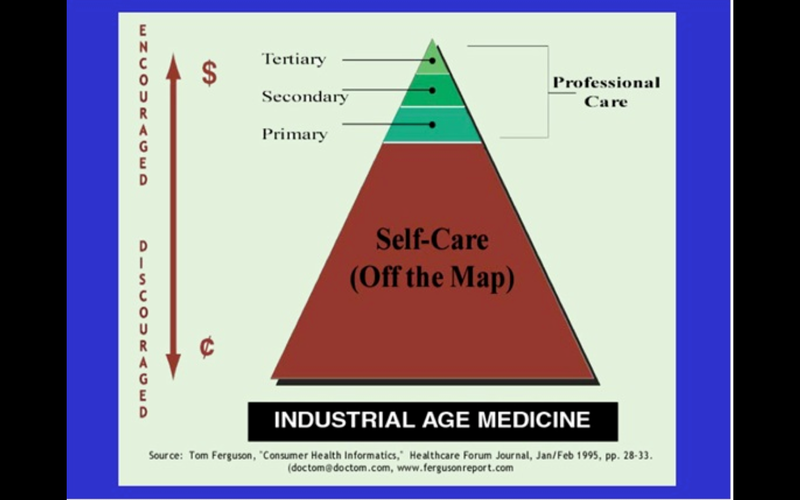 Adherence to a regimen is important…Same with the pill-in-the-pocket strategy – a favorite of mine….Then there is lifestyle – which you will hear more about later….Active, not passive. 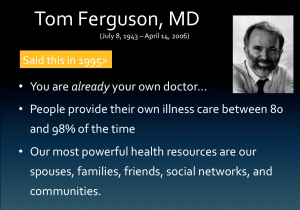 Thinking about an active patient brought me to learn about Dr. Tom Ferguson. 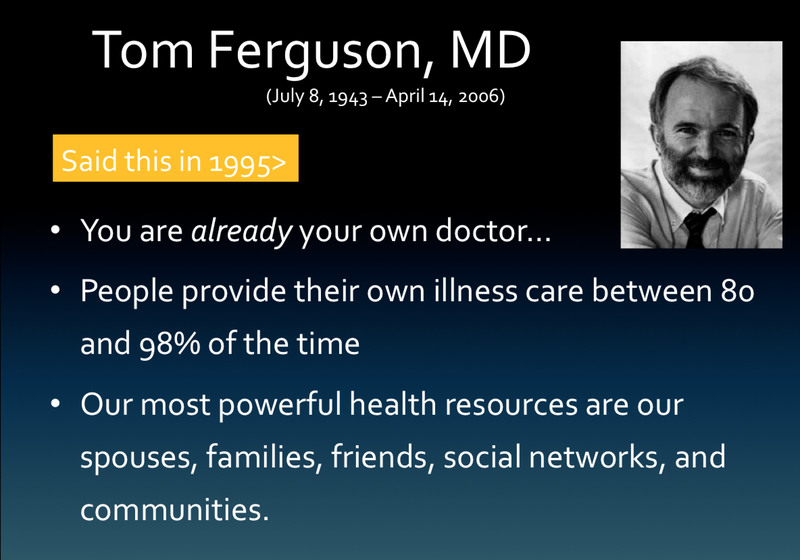 Slides 26 and 27 are constructs that Dr Ferguson published in 1995. What is so amazing is that he predicted this in 1995. Look at that second triangle. It’s exactly how I see the role of caregivers. Now I want to switch gears and talk about the patient. 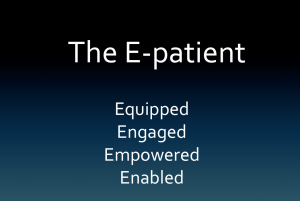 But what I learned in preparing for this talk is that the E stands for equipped, engaged, empowered and enabled. 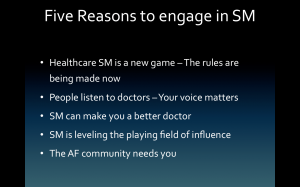 The first reason to engage with SM is that it is an new game. Other than the basics (being nice, being real, being honest and sharing), there are few rules. 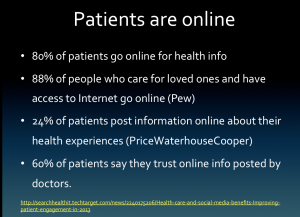 Dr Bryan Vartededian calls us the “digital natives.” We will make the rules. The second reason to engage is that your voice matters. 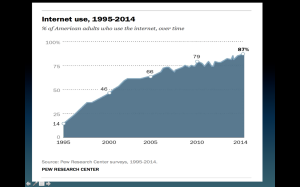 The Internet overflows with information – some good and some not so good. I believe there is a sweet spot out there online: On one end of the information spectrum is the medical-society group speak (Up-to-date like stuff) and on the other end is the pseudoscience of people selling things . The sweet spot is information that is accessible and real. 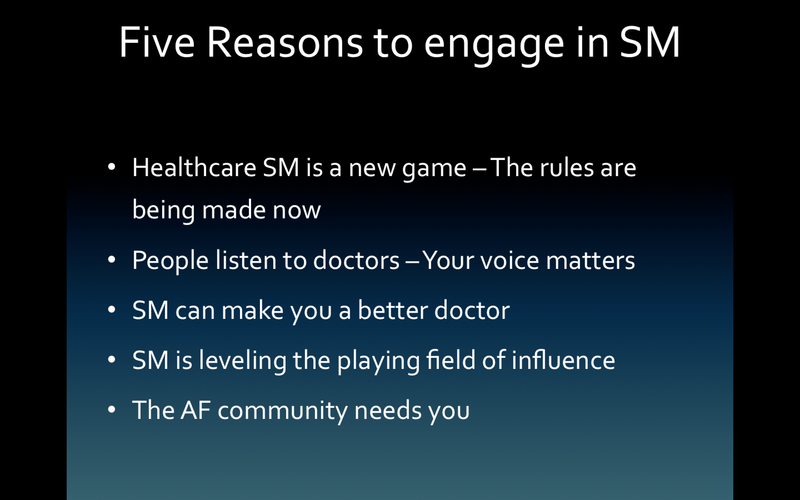 The most important reason to engage with SM is that the AF community needs you to. The graduate student I mentioned needs you. 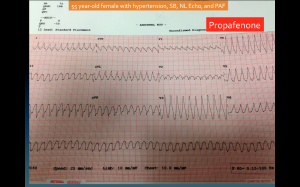 The elderly patient with asymptomatic AF who is put on AAD needs you — so does the young woman on Amio. The ER medicine community needs to hear it’s okay NOT to give IV-diltiazem to every AF patient. Doctors need you. 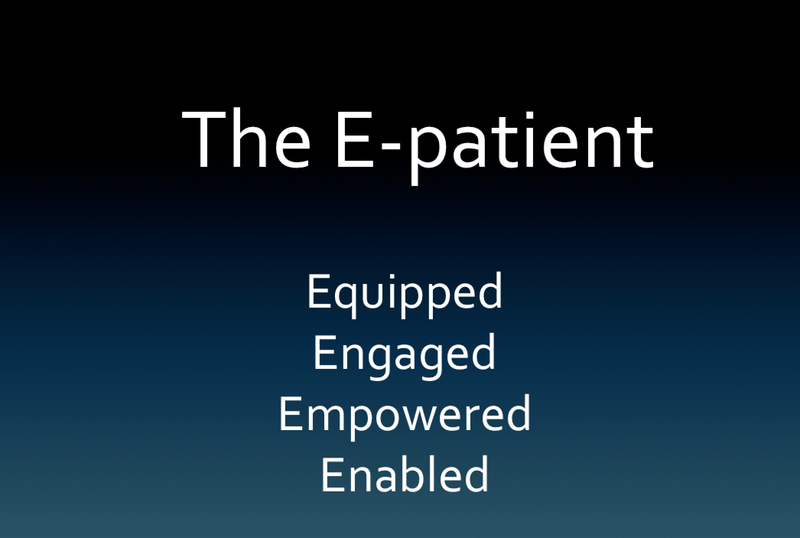 Patients need you. You are the leaders. Your voice needs to be heard. One of the chairs of the session asked me a question. He wanted to know how people trusted information on the Internet. I answered in two ways. First, I said gathering information from the Internet required judging (vetting) the information for accuracy. The young generation does this normally. They grew up with the Internet. But vetting an information source is normal. We, in medicine, do it all the time. We judge a journal article by the prestige of the journal, its past history of editing success and the conflicts of interest of the authors. We judge a lecture by our knowledge of the speaker…He always says that sort of stuff. My second answer to that question was that the quality of information online would be improved greatly if leaders in the field were there. Right now, the voice of leadership in electrophysiology (and Medicine in general) is locked behind pay walls in journals. 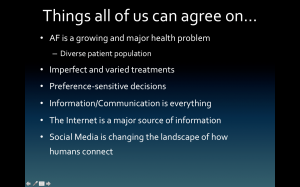 Doctors and Social Media — It’s time to embrace change. Very nice presentation. Well organized and tells a story. Could you please define the word “rotor?” I’ve seen it in several articles you’ve referenced, but I don’t have the vocabulary to completely understand what it is, what it does, or why it’s important. Nice post! Totally agree about the tremendous (still untapped) potential of Social Media. It is time-consuming …. so a balance must be struck – but potential impact is absolutely amazing (not only in this country – but worldwide!). THANKS for writing this and sharing slides from your talk!